The perfect gift for your favorite gardener includes 10 packages of Rich's most popular heirloom seeds (Sulfur beans, Reid's Yellow Dent corn, Chiogga beets, Amish cockscomb, Delphinium, Love Lies Bleeding, Genovese basil, Lemon balm, Garden sage and Giant Sungold sunflowers), a pair of gardening gloves, and a set of gardening tools, all in a decorative basket. The Cook's Basket is a great gift for everyone! Seven different cooking herbs, grown in our gardens, have been picked at the height of flavor, dried and packaged for your enjoyment. Genovese basil, English thyme, Garden sage, Rosemary, ground Coriander seeds, Parsley, and Apple mint are attractively packaged, and presented with a set of three wooden spoons and a quilted oven mitt. The Locals have known for years that Rich's is the place to get their Dried Herbs as well as the live herb plants and seeds. But now some of that secret knowledge of herb uses is leaking out! We have put together a gift pack with three of our famous BBQ Dry Rub mixes. Made from our home grown chilies, garlic, onions, and other vegetable and herb combinations, together with carefully selected natural and organic ingredients from our friends - you know it is Good! The 3 Flavor Gift Pack contains 4 oz. 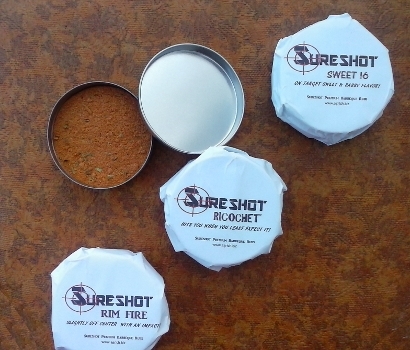 tins of each: Rim Fire -the medium hot mix (emphasis on hot); Richochet -the medium (that chili may sneak up); and the Sweet 16 - sweet with mild chili and multitude flavor. What better way to give an exotic gift to your favorite gardener! richfarmgarden's extensive internet catalog of rare and unusual items makes just reading the catalog a fun and very enjoyable experience. The Recipient of your gift will enjoy the shopping experience as well as the garden's plants. 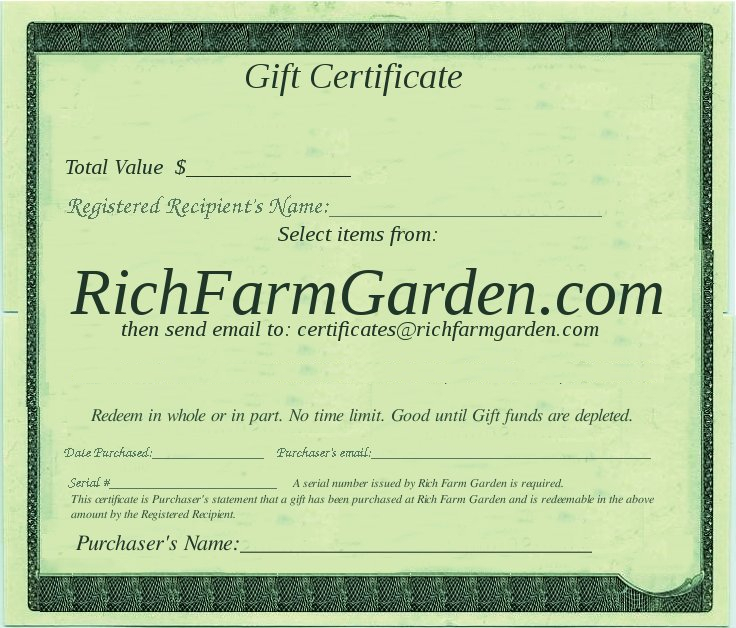 Rich's Gift Certificates are available in $25 increments. Adjust the quantity on your order upon check-out to give any amount that you wish; an account will be set up in your recipient's name. After checking-out, send an email message to us with Recipient's name. We will send an email to you with the certificate serial number that your Recipient will need to redeem your gift. You can wait for us to send the Serial Number to you before notifying the Recipient of your gift, or go ahead and tell them, so they can begin shopping but tell them that you will be relaying the number. 4. Tell them how you registered their name. They will need to use the exact same name. Print the above certificate to use in conveyance of your gift, if you wish. Go to the image file: giftcertificate.jpg then use your browser print function. Use your Back button to return.